Suddenly, I am in the bosque in the land of enchantment, trading the Charles River for the Rio Grande. My husband and I flew to Albuquerque early this morning, arrived in time for lunch with old friends of the family. As soon as we arrived at the resort I tied on my sneakers and rushed outside to find the walking trails. 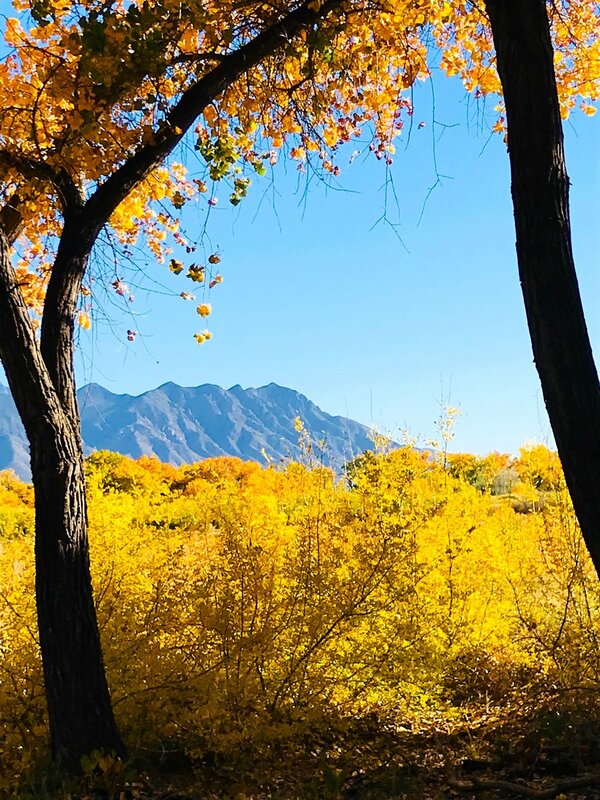 Under a cloudless sky and a late afternoon sun, I had #mydailywalk in the most stunning beauty of the cottonwood trees at their autumn peak of sunflashed gold. The cottonwoods were a complete surprise. I've been to New Mexico a few times, but never in October. I walked a dirt trail and found myself bathed in light from golden leaves with the blue mountains meeting the blue sky behind them. Oh, this day of bliss. Lunch with Max and Cherie, dear family friends who adored my parents, and this was mutual. Max and I have known each other for fifty years. Here was my father's smiling presence at the table seated between us. Of course Max teared up at least twice. The times my father visited him here were precious to Max. I was a little girl when I met Max, a twenty year old Harvard student in my living room. Now he is suffering from parkinson's and dementia. But today, today we have lunch, loving conversation, and then I have the day sealed into memory with shocking intensity of the cottonwoods, here and now, and not to be missed.